Life with Lesley: BFS #101 - Plop, plop, Fizz, fizz; Oh, What a Relief It Is! BFS #101 - Plop, plop, Fizz, fizz; Oh, What a Relief It Is! Memory Verse: Psalms 55:22 - Cast thy burden upon the Lord, and He shall sustain thee; He shall never suffer the righteous to be moved. Assignment: This would be a good week to tell about your worst struggles with a lifestyle of homeschooling. Tell about something you’ve struggled with and how God’s mercies gave us the strength to get past it. Also, share any curriculum/homeschool methods that have been a relief to you, i.e., a particular Teacher’s Manual or Homeschooling method that’s been easier for your family. Talk about how you felt when the burden was lifted and Oh, What a Relief it is! Hmmm, well, as I've just started this journey I can't say much about curriculum or homeschool methods since I'm still testing it all. BUT I will admit my worst struggle has been myself. I've doubted my ability as to whether or not I could homeschool my daughter. I've prayed about it and given it to God. I have been blessed with "meeting" so many wonderful, helpful people through different websites and blogs that I am actually starting to think I might be able to do this. I'd like to take this chance and thank everyone who left encouraging comments on my last BFS post. I appreciated the time you took to leave me your bits of wisdom. Keep 'em coming! Verse: Philippians 4:13 I can do all things through Christ which strengthens me. One piece of advice I have heard over and over that has really helped me is that they will get it. Sometimes it takes longer than what you think but they will get it. You can do it. Just have faith in God and yourself. God didn't make this available to you if he didn't think you could do it. Hello! I am stopping in from BFS. You are not any different from most homeschoolers, we all have our doubts. As one that came to homeschooling confident, once we actually started I had my doubts too. But the Lord had been there each step of the way. He will be there for you too. Hi. I'm right there with ya! I'm new this year and you've done what is the best step anyone can do...given it all to God! Praying you have a good year. Well, you will never really get over that, "I dunno if.." feeling. But any time spent homeschooling your child(ren) is a blessing. And as you settle into your groove-things will become more comfy. It is very nice to have others to chat with and read their stories-very uplifting and encouraging...even for those of us who have been doing this a long time! I think a lot of struggle with feeling inadequate when it comes to the awesome responsibility of teaching our children at home. Rest assured you are not alone, and you will do just fine! We chose the same verse! Advice - have confidence that God will never leave you in this journey. He is just a prayer away (I know that's a silly cliche' but it's soo true). God said if anyone lacks wisdom, just let him (or her) ask and it will be given in abundance! 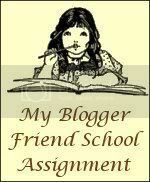 Don't be afraid to tap into the resources and ideas and brains of other homeschooling moms! That's what we're here for! I remember having the same doubts - sometimes still do. You'll be amazed at what you CAN do! Keep at it! Welcome to homeschooling! Congratulations on your choice. You will never reget it. I have a daughter a little older than yours, and I can't imagine her going off to school either. She is really blossoming here at home, and has started her first sewing project! She would never have been able to do that in school! I think even veteran homeschoolers struggle at different seasons of this journey with the same "Can I do this?" issues. But as your chosen Scripture says, you CAN do all things with Christ! Try to enjoy the process and don't sweat the small stuff. As you see there's lots of help out there. Congrats on making the Featured Friend's list. You have very good links on your site. Welcome to a wonderful journey! Through all the trials and difficulties, I have discovered that homeschooling is such a blessing. I would want it no other way! Blessings to you! Homeschooling can be somewhat overwhelming we know that the Lord is with us as we raise His children. My prayers for a successful and bountiful year are with you. So nice to here when someone is starting out, have a great start. I have not been so lucky, but I am still here and still hanging in and wont give up. Have fun with your daughter as she and both you and your husband enjoy the new man in the home. You are on an incredible journey this year and it is hard to fight the feelings of self-doubt. However, you are doing what is best in turning it over to the Lord. Just make sure you are actually opening your hand and letting it go. Do not try to hold onto it. Praying you have a wonderful year full of surprises and learning. Thanks for visiting my blog! I hope to hear from you again! Oh! And yes, yahoogroups are great as long as you don't subscribe for Individual Emails. Some groups are really chatty! I always go for the Daily Digest.